It's safe to say that Kataklysm helped pave the way for the Montreal, QC death metal scene, which has continued to flourish over the years. Since their 1991 inception, they've consistently churned out quality records and Heaven's Venom, their 11th studio release, is another top-notch album exhibiting their signature "Northern hyperblast" style. 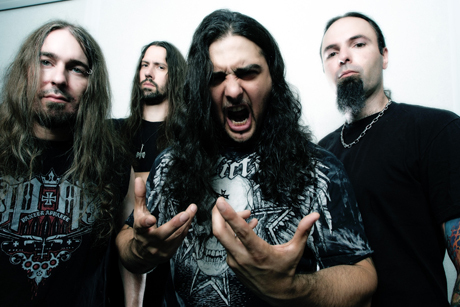 While not as groundbreaking as 2004's Serenity In Fire, Kataklysm have definitely surpassed previous album Prevail. Unrelenting and catchy as hell right from the start, with "A Soulless God," the album is a return to their early days. Tracks like "Determined (Vows of Vengeance)" mix old school Kataklysm with some newer, more technical elements. "Faith Made of Shrapnel" is an album highlight, reminiscent of Serenity In Fire, with classic hyperblast beats, as well as fast and crushing guitar work, courtesy of mastermind Jean-Francois Dagenais. As per usual with Kataklysm, many of the tracks on Heaven's Venom are traditional headbangers that will definitely transfer well live. "Push the Venom," for example, will be an instant fan favourite, showcasing vocalist Maurizio Iacono's distinct, deep, aggressive roars. With a release like Heaven's Venom after almost 20 years, it's no wonder Kataklysm have lasted this long. What was the musical direction behind new album Heaven's Venom? Iacono: We just had a very tough three years internally in the band, not between us, but everybody in the band had personal stuff going on in their lives. It was very similar stuff and we connected really strongly on this record when we decided to do it. It came out really aggressive, but we didn't aim for anything; it just came out the way it came out. Songs like "Push the Venom" are not overly technical, but they go to the point and hit you where they need to hit you. For every song, how it was put together depends on the feeling. We tried our best to be real to what we do; we're not trying to become something that's in a trend area. It was a very natural record for us to make at this point in our career. Why the title Heaven's Venom? In the world we live in, there's always going to be good and bad, and bad and good, and it's actually important to have both because it levels off everything and it's a perfect balance to be able to move forward in life. Too much of something is not good, so having a little bit of stress in your life is important to be able to appreciate different things that happen to you. Heaven's Venom is just being in a place where you think everything's great and then there's this thing that you can't believe is there that makes it bad, and it's just about dealing with it. On some of the tracks it sounds like there is a return to the Serenity in Fire days. It's a much more aggressive record than Prevail. It might not have some of the same speed elements, but unwittingly, we got a little of Serenity in Fire, a little bit of In the Arms of Devastation and I think also some Shadows and Dust. It was just a very pure balance of our last four or five records. In some places, we actually go way back, which when you listen to this album, there are a lot of things that need to be connected in order to understand it. You'll see another face of the record once you read the lyrics, because this album connects everything. If you understand the meaning behind this record, you're going to understand and appreciate it a lot more. It's a really deep record and it hits a lot of things that a lot of people go through in their lives and we're that type of band; we don't want to do anything that's meaningless. It's important to write lyrics that people can adapt to and understand what I'm going through. The musical aspect touches a little bit on Serenity in Fire, but it touches also on a lot of different elements and that's what makes this record complete. Many of the tracks on this record, and on many of your past releases, transfer really well live. Is that something you keep in mind when writing? Absolutely. This is a live-driven band. Kataklysm built our fan base on the live front; we were never a band that got big because we released records. A lot of bands do that, but then they can't bring what they've done on the record live. When we write a song, we want to make sure that when we play it live, we can play it and it sounds killer. A lot of our ― I don't want to say the word "hits," because we're not a pop band ― but a lot of the big Kataklysm songs became big because of playing them live. That's the second part of making a Kataklysm record; it's going on the road and supporting it and making people understand what we're doing. This is the band's 11th studio album after almost 20 years together. Did you expect to still be making music after this long? Who knows where you're going to be five years from now? When we started understanding what the industry is all about and seeing how hard it is, it was a tough thing to believe that in 20 years, we'd be here and be stronger than ever, which is very uncommon for bands. Our last two records have been the biggest records in our career and to see us reach that level is crazy. There's something real about Kataklysm that people understand and feel close to us and that's why we have such a strong fan base. Kataklysm invented the term "Northern hyperblast." Would you still use it to describe your sound now?